News TV Channel / Apple Daily is a Hong-Kong-based tabloid-style newspaper founded in 1995 by Jimmy Lai Chee Ying and is published by its company, Next Media. A sister publication carrying the same name is published in Taiwan, Republic of China under a joint venture between Next Media and other Taiwanese companies. 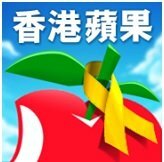 Apple Daily tends to favour the pan-democracy camp in its editorials and commentaries.